The CJ Cup @ Nine Bridges, the first ever PGA tour on Jeju, is starting today, but one player decided to come to the island a little early and try out some of the island's famous activities. Adam Scott is a former world number one golfer who will be taking part in this month's tournament. 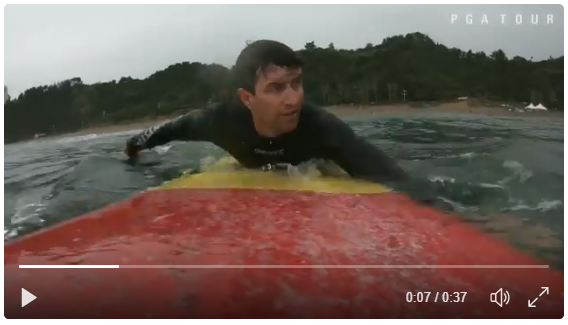 In the video, posted to the PGA tour Twitter account, he can be seen surfing at Jungmun Beach and then enjoying some of Jeju's famous black pork. While the weather hasn't been at its best recently, Scott certainly looked to enjoy himself while out surfing on the beach. The event itself is the first ever PGA event to be held in Korea. Some of golf's biggest names such as Adam Scott, Justin Thomas, and Korean Kim Si-woo will feature at the tournament. In total 78 players will take part in the tournament to battle for the $9.25 million in prize money. Starting on Oct. 19, the tournament will continue to run until Oct. 22 at the Nine Bridges Golf Course on the southern side of Jeju Island.